Aqua Marina is a growing company providing paddle boards and boats for leisure and fitness. They envision offering maximum fun and safety for their buyers with their array of inflatable paddle boards, canoes, kayaks and sports boats. They may not be the best-known brand in the SUP industry, but they do provide reliable and affordable inflatable paddle boards. The Aqua Marina SUP boards come with their signature assembly of heavy-duty PVC, hardened rubber materials, multiple layers of polymer, UV protection and drop stitch core material. Not only that, they generally create user-friendly, versatile and very safe boards. Inflatable paddleboards are a great investment and every paddler should have one. Although epoxy SUP boards are awesome (and some would argue they are the best), they come short in some ways. For instance, you cannot deflate and roll up your fiberglass SUP when you want to store or transport it – especially if you are using a plane. iSUPs are better for families because they are cheaper and you can get more than one. They are also kid, pet, and beginner friendly. That said, you want to be sure that you get the best iSUP both in terms of quality and what matches your preferences. Here are some of the best Aqua Marina SUP boards. 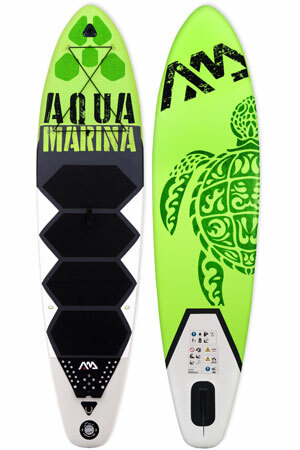 Aqua Marina offers you an inflatable board in the world’s most popular SUP shape. The Breeze is a 9’9” paddleboard with a very versatile shape and an optimum air pressure of 15 PSI. It is the perfect board for entry-level paddlers who want to get a feel on the water-sport by trying it out in different environments. With the Breeze’s versatile shape, you could take it out for fitness, exploring and small surfs. 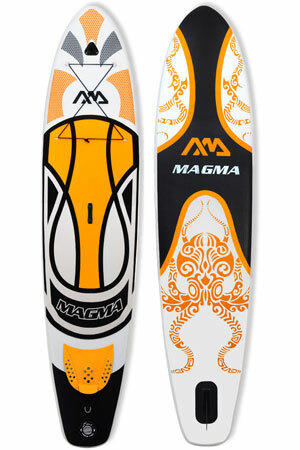 You won’t go wrong with this SUP shape that is very similar to the traditional long board. As for versatility, you can also attach a high-kayak seat since the board comes with extra D-rings. Care for some kayaking after paddling sessions? With the Aqua Marina Breeze SUP, why not? The Aqua Marina Breeze is made using strong PVC material and a double-wall drop-stitch construction making it one of the most durable boards you can lay your hands on. The deck features a honeycomb design traction pad to prevent you from slipping as well as make you comfortable. There is a bungee system fastened on four D-rings to offer you storage for your essentials. Another D-ring is available at the tail for your leash. The Breeze paddling package includes a 20 PSI manual pump, a 2-piece paddle, a backpack, two side fins and one center fin. The color of the board is black/green. Customers, in general, are impressed with the quality of the board and its ease of transportation and assembly. Just remember to put on the fins before you inflate the board, and you’ll be fine. The Aqua Marina Breeze SUP is said to have a maximum weight capacity of 209 lbs, but one customer reported that her boyfriend, who weighs 185 lbs, experienced the board bending so much that he got his feet wet. She herself is about 130 lbs, and the board carried her fine. So keep this in mind when considering this board. If you weigh a bit more, perhaps consider the Aqua Marina Fusion. Love to go cruising on lakes or canals? 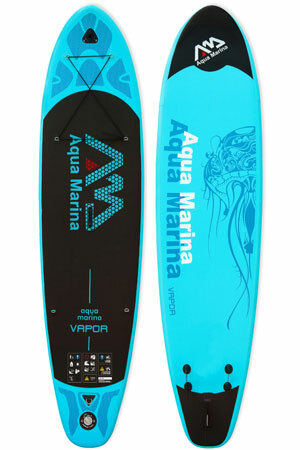 Another very versatile board is the Aqua Marina Vapor SUP. The Vapor is an extremely user-friendly 10’10” board. 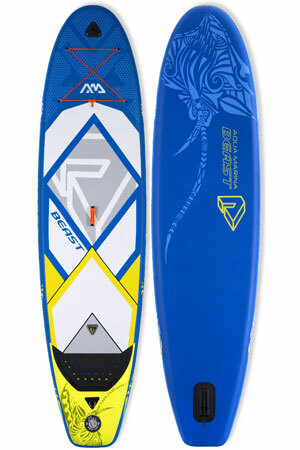 It is the ideal board for all skill levels and lightweight paddlers. Ride with comfort and stability with its sculpted balance flow curve board design. Along with the Vapor paddleboard, you’ll get three fins, pump with gauge, backpack, and adjustable aluminum paddle. All three fins are removable and you can attach them depending on conditions. The paddle is three-piece, adjustable and made of aluminum. The Aqua Marina Vapor SUP comes with a durable double-wall stitch core material. The EVA deck is surfaced with a heat-embossed honeycomb groove. This design provides you with maximum traction and durability. In addition to the 4 D-rings that have a bungee cord fastened on them, there are more D-rings for your leash and any other use. The Vapor is 10’10” long, 30” wide and 4” thick. These measurements make it a great board for speed. A long and slim board provides for a streamlined shape that enables it to slice through the water with such ease. Add to that the tri-fin system and you have yourself an iSUP that perfectly suits your adventurous self. Many customers love the Aqua Marina Vapor. It is lightweight, stable, and of general good quality. Since it’s a fairly thin board (4”), experts recommend it for flatwater paddling. Heavier paddlers, from about 200 lbs and up, frequently report that the board bends too much, even when pumped up to its maximum 15 PSI. 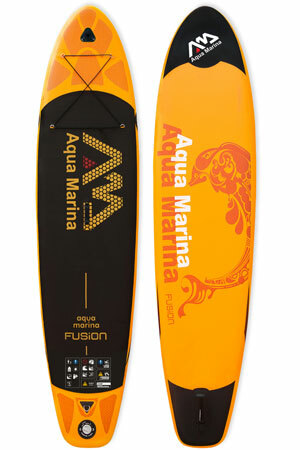 So if you require a board that can carry more weight, perhaps you should consider the Aqua Marina Fusion. If you’re looking for an inflatable board that can take on greater weights, the Aqua Marina Fusion SUP could be the board for you. The Fusion comes with an all-around design and has a reputation as an excellent flatwater, cruising board. Its length and width provide you with excellent glide for exploring, fitness and cruising. The Fusion SUP Package includes a 10’10” board, elastic bungee cord, backpack, hand pump, a 3-piece paddle, a large slide-in central fin, a repair kit and a manufacturer’s limited warranty. An all-around wide design and durable double-wall stitching PVC provide superior stability. The heat-embossed EVA deck with honeycomb grooves will keep you from slipping and bungee cords on the nose hold your cargo while exploring the waters. It is built for riders of up to 308 lbs. Compared to the Breeze and the Vapor, the Aqua Marina Fusion SUP is 2 inches thicker, making it more rigid when inflated, and providing more stability. Reviews show that customers love this paddle board. Inflating the board with the included pump takes about 10 minutes. The board is stable, can carry quite a bit of weight (308 lbs), and is of good quality. For tall paddlers, you might want to consider investing in a paddle since the paddle that comes with the Aqua Marina Fusion, is adjustable in 2 settings and you may find that you need more length to paddle comfortably. When you’re finished on the water, the Fusion deflates quickly and packs up in the included backpack making it the ultimate travel companion. 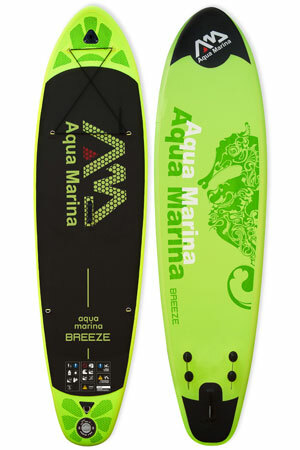 Now, check out one of Aqua Marina’s best selling SUPs. The Aqua Marina Monster SUP is a lightweight paddle board but it’s certainly a monster when it comes to its weight capacity. The Monster SUP can carry up to 352 lbs while still providing the needed stability. It is the perfect board for paddlers of all skill levels who are looking for a professional level experience. 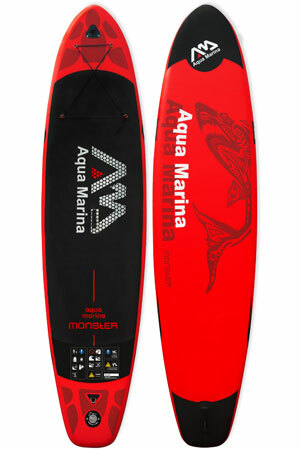 Upon purchase of the Aqua Marina Monster SUP, you do not only get the 12’ x 32” inflatable paddle board. You also get a 3-piece paddle, a high-pressure hand pump with gauge, a removable center fin, two side fins, and a storage backpack. The board comes with a heat embossed EVA deck pad and a bungee storage system that can hold your things as you either sit down or stand up and paddle. The construction of PVC is done with a durable double-wall Dropstitch construction to a flat angle design. Customers are very happy with the Aqua Marina Monster. They find it of good quality, made from thick and durable materials, stable in the water and able to carry a lot of weight. One guy even took his son and dog with him on the board. A combined weight of about 375 lbs and they stayed well above the water line. With a design inspired by the sea turtle, the Aqua Marina Thrive has a unique look that will appeal to any SUPer’s eye. It is more of an improved version of the best selling Aqua Marina Breeze. The board measures 9’9” in length, making it a great board for beginners and young adults. Longer boards tend to be a little difficult to control for paddlers who are just starting out. It is 30” wide which gives you enough deck space for moving around and allows you to bring a pet. The thickness is 6”. A thick inflatable iSUP is usually more buoyant than a thinner one and is not bendable. The deck is covered in a honeycomb design soft pad for traction and comfort. The Aqua Marina Thrive offers maximum durability. It is made from tough PVC material which protects it from dents and dings. It is also made using the Super Tough Dual Stringer technology for reinforced stiffness. The Thrive package includes an adjustable paddle, high-pressure pump, slide-in fin, backpack, action camera mount kit and a valve adaptor. Customers are impressed by the graphics. The Aqua Marina Thrive looks even better in person than it does in the pictures. It is very high-quality, something you will notice as soon as you get on it. The included accessories look amazing and are all durable. It looks like the Aqua Marina paddleboards company has decided to treat its customers to awesome designs with its new models. The Marina Echo, like the Thrive, has a very interesting design. Being an all-around paddleboard, it is suitable for use by paddlers of all skill levels and for all water conditions. Its shape provides for an effortless glide. To ensure maximum durability and stiffness, the Echo has been reinforced with double rail construction. The measurements (10’6” x 32” x 4”) favor the SUPer that loves to explore and go for long SUP tours. The width will not hinder your speed and the length makes it very easy to handle. The deck has a soft traction pad in case you want to try out Yoga. The Aqua Marina Echo SUP package includes a carry backpack, slide-in fin, action camera mount kit, valve adapter and a manual pump. Unfortunately, a paddle is not included. Aqua Marina did not forget to include a bungee system for your cargo and a D-ring for your safety leash. 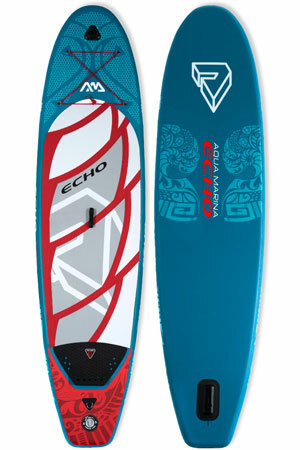 Paddlers like the Aqua Marina Echo mostly because it is lightweight and versatile. It is not limiting and is fit for use by the whole family. Inflation is not such a difficult task. In the water, the board glides smoothly. Its stiffness is impeccable. The Echo iSUP is also very stable. Some users were disappointed by the lack of a paddle in the package. The Aqua Marina Beast is a beast indeed. Although it is very light, the board has a higher capacity than many iSUPs of the same weight. Its shape is suited for racing while its capacity of 315 lbs allows you to have that experience with a friend on board. Just like all new models from Aqua Marina, the Beast has been reinforced using the Super Tough Dual Stringer technology which makes it ultra rigid. The deck features a carry handle in the middle to give you an easy job as you carry your inflated board to the water. There also a bungee system so your luggage will not fall off when you are catching waves or being a little adventurous. The graphics, both at the top and bottom, are quite interesting—you can barely look away. The Aqua Marina Beast paddling package includes a Magic backpack, manual pump with gauge, valve adaptor, slide-in center fin and an action camera mount kit. What is not to love? When choosing a board, most of the time you have to choose between a light iSUP and one with a high capacity. Standup paddlers are happy they do not have to make that choice with the Aqua Marina Beast. It is super light, durable and can handle 305 lbs. This iSUP tracks well in water and users say that it is stable and nothing short of perfect. The Aqua Marina Magma is arguably the best iSUP among the new Aqua Marina new models. The graphics are super cool, inspired by the octopus. The outstanding print is hand-made resulting in a beautiful iSUP that makes standup paddling more enjoyable. The Magma is made using the premium Dropstitch core material technology resulting in a very light board that is stiff and durable. On top of this, it has been reinforced using the Super Tough Dual Stringer technology for extra rigidity and stiffness. Because of its measurements (10’10” x 30” x 6”) the Magma assumes a streamlined shape, long and slim, making it an amazing speed paddleboard. The Aqua Marina Magma SUP package includes a high-pressure pump, adjustable paddle, backpack, removable fin, valve adaptor and an action camera mount kit. The deck has elastic straps, fastened on four D-rings for securing cargo. One more D-ring is attached at the nose for your safety leash. The Aqua Marina Magma has outstanding features—it is no surprise that it has gained the love of its users. It looks amazing and is bound to make your experience even more exciting. The iSUP cuts through the water with impeccable smoothness, thanks to its shape and the large center fin. Riders also love the all-inclusive package. Aqua Marina is one company that you can never underestimate. They actually have some of the best and coolest water sports products in the world. You can easily tell from their paddleboards that they mean business. From the designs to the performance of the above Aqua Marina SUP boards, everything is of high quality and it is highly unlikely that you will be disappointed. Take advantage of their fair prices and get yourself one of these awesome boards.